Can you believe it? 1996-97 presented 81 helpings of original sitcoms strewn across the six networks. Look closer, as duplicate showings on FOX and WB gave singular shows 2-3 places on this grid, making the hard number in this table 75. However, these shows broadcast live shows, so they count as 81. Of those, 41 would survive to the next season, and only 32 would see the following season. NBC of course was placed firmly in 1st, with a surprising resurgence from ABC after the previous season experienced drops. CBS lost its brief renaissance and descended lower, and FOX experienced an alarming decline. UPN was still 5th, and like its 6th Place neighbor WB, generated few hits which showed the fledglings had yet to grow like FOX did within its 3rd season. Paint the charts blue, as ABC obviously ruled this season. The greatest surprise in the sitcom ranks is NBC and ABC shared the lead as 1st Place with their sitcom offerings. This has to due with NBC housing 8 sitcoms which registered between 64th-92nd Place, while all but one ABC sitcom ranked at or above that place this season. CBS Mondays delivered a lackluster comedy block, with its highest entry placing at 22nd. FOX went for broke with 11 sitcom entries, with only Simpsons, Living Single and King of the Hill coming back, leaving massive holes in FOX's schedule. Notice a bunch of shows sitting at the top of the pack that are hard to remember? That is because most tailed on or led up to the hits and blended in. Their true value would be tested the following season after being farmed out from prime soil, a la The Great Indoors or The Millers in recent years on CBS. Veteran did not fare well this year in new ventures as clunkers with "A Big Star" were shown the door in the burgeoning choice era. Did NBC really expect us to believe Jonathan Silverman could carry a sitcom years after success with Weekend at Bernies? Or Bateman siblings Justine and Jason could pass on Men Behaving Badly or Chicago Sons? The biggest laugh was after years of shining her rear end on NYPD Blue, Sharon Lawrence could carry laughs with Leah Remini on Fired Up. 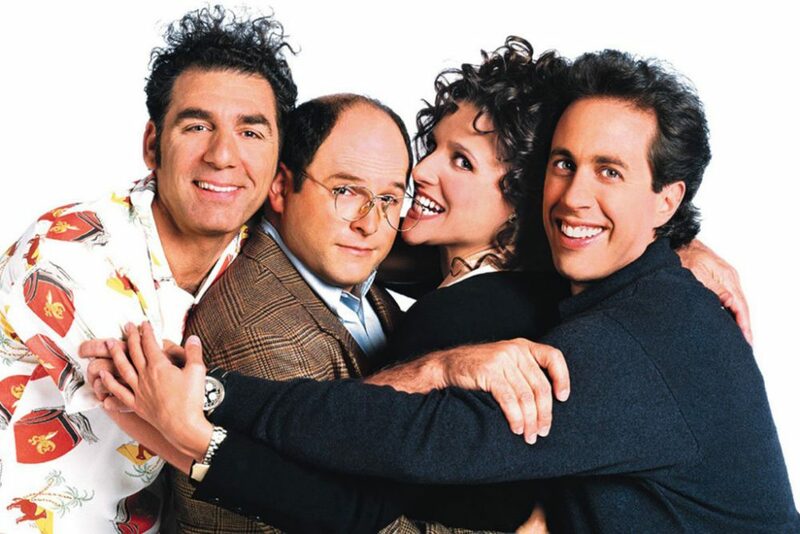 They utilized enough of their Seinfeld lead-up to survive, yet their sitcom's ratings value was disrobed the following season. ABC tried Dan Aykroyd with Soul Man, which aired three episodes and received only one more season. CBS offended viewers with this trend and gave its "stars" pink slips. Bill Cosby evaded this fate as Cosby managed respectable ratings years after The Cosby Show ended. But did they expect viewers to see Sam Malone working in publishing on Ink, or tart Carla Tortelli as a middle-aged college Freshman on Pearl? This generated bigger laughs than their new sitcoms. The only graceful thing CBS did was spare a struggling sitcom called Everybody Loves Raymond. It sits at 84th place with ratings shorter than Patricia Heaton's hairdo this season. 1997 presented the end of several longstanding favorites. ABC led the carnage, ending Roseanne (9 seasons), Coach (9 Seasons), Family Matters (8 seasons), Step By Step (6 seasons) and Hangin' With Mr Cooper (5 seasons, absent from this chart as it burned off in the summer) in a massive swoop. NBC ended Wings (8 seasons) and The John Larroquette Show (4 seasons), and CBS unceremoniously ditched Dave's World (4 years). And FOX parted with Martin (5 seasons) and the show it owed its existence to, Married... With Children (11 seasons) after a hearty, crude run. Family Matters and Step by Step would receive one additional (and forgettable) season on CBS the following year.